Tall, quick and athletic, the 5A Idaho Falls Tigers and 4A Bishop Kelly Knights seemed to be and proved to be the top two teams among 12 squads in the 31st annual Wood River Invitational prep volleyball tournament Sept. 16-17 at the Hailey high school gym. Coach Wendy Johnson's Idaho Falls Tigers had too much firepower for Bishop Kelly in the final showdown. The Tigers captured their fourth consecutive Wood River Invitational title 25-11, 25-13 Saturday in the deciding match of the double elimination meet. Bishop Kelly, last year's State 4A tournament fourth-place finisher, had forced a deciding game with a 25-20, 29-27 victory in the first championship clash. That's when Idaho Falls (16-4), last year's State 5A runner-up, settled down and played some of its best defense with some of its best passing. Tying for fifth place was host Wood River. The Wolverines played some of their best volleyball in a 28-26, 24-26, 15-12 elimination loss to 5A Boise, last year's State 5A third-place finisher. Boise went on to oust Mountain Home 25-23, 25-23 and then drop a close one 25-11, 23-25, 15-11 to Bishop Kelly. Wood River coach Tim Richards said, "Overall this weekend was a great learning experience for our young girls. We saw progress and lost a lot of close games by just a few points. "Kori (Paradis) and Lily (Richards) led us in kills and assists and service points. Mercedez (Powell) led our defense and Alison and Miranda Gasenica served and defended well. Most of the weekend we started a junior varsity player, ninth-grader Hayley Cutler, in the front row. She played well. "Hopefully we can carry our improvement into this week's league games." In Friday's pool play, Wood River went 2-1 in its three matches to earn a three-way tie for the top seed from its pool, but the Wolverines ended up third in the pool-play tiebreaker. In pool play the Wolverines defeated Mountain Home 25-18, 21-25, 15-11 and Payette 25-19, 22-25, 15-5. The Kimberly Bulldogs beat Wood River 25-23, 9-25, 15-11. Saturday morning, Bishop Kelly defeated Wood River 25-21, 25-12 as tournament action opened. In the consolation bracket the Wolverines stayed alive 25-11, 25-19 over Kuna before playing its three-game thriller with Boise later Saturday. 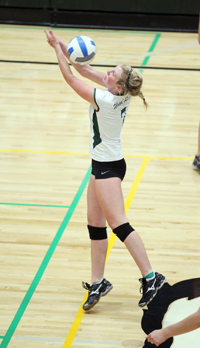 In the four-team consolation tournament, the winner was Burley 25-9, 21-25, 16-14 over Borah of Boise. Co-Most Valuable Players were Idaho Falls senior Hayley Farrer and Bishop Kelly senior Rebecca Sweeney. The six on the All-Tournament Team were junior Katrina Inch and senior Ashley Kenney of Boise, senior Jade Gray of Borah, senior Dylan Dean of Mountain Home, senior Alexis Ruffing of Bishop Kelly and senior Kaitlyn Johnson of Idaho Falls. On Tuesday night, Wood River (7-11, 1-2 league) hosted the Jerome Tigers (3-3, 2-1) at the Hailey gym in an important Great Basin Conference clash. Jerome, winner of its home tournament last weekend over Pocatello, has swept Burley and Minico in league while losing in three to Twin Falls. Wood River visits Minico Thursday, Sept. 22 and has a rematch with the Canyon Ridge Riverhawks Tuesday, Sept. 27 in Twin Falls.